NOTICE OF RACE FOR 2019 470 JUNIOR WORLD CHAMPIONSHIP IS PUBLISHED! 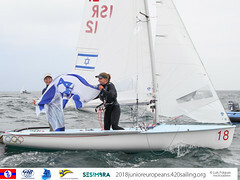 Notice of Race for 2019 470 class Junior Worlds is now published! Fifth day of racing in lake Bracciano for 470 class 2018 Junior World Championship and it was a great one full of action on the water. Fourth day of racing and last day of Qualifying series for Men’s division in 470 2018 Junior Worlds and it was another difficult day with big wind shifts testing the patience of all parties involved. Third day of racing at Lake Bracciano, Italy where 2018 470 Junior World Championship takes place. Although forecast was not promising, after 15:00 hours south thermic wind kicked in but the direction was variable. Day 2 of the Qualification Series at 2018 470 Junior World Championship and 2 races were sailed for all teams. The International 470 class Association returned to beautiful Bracciano with the 2018 Junior World championship. The lake and Yacht Club Planet Sail Bracciano will host six days of tough competition and around 160 athletes from 22 countries, scheduled from 21 to 26 August. Yesterday, the training clinic in preparation for the 470 Junior Junior Championship in Bracciano has finished with the participation of 5 boats from 3 different countries, Argentina, Italy, Holland. Spain’s Silvia Mas Depares/Paula Barcelo Martin today successfully defended their Junior World title and France’s Hippolyte Machetti/Sidoine Dantès claimed their first 470 Junior World Championship victory. With the imminent arrival of Typhoon No. 15 in 2 days, the advance weather conditions kicked up the breeze and sea on race day 4 at the 2017 470 Junior World Championships in Japan. A gentle southerly sea breeze started to fill in the race area around 1100 hours with a breeze of 10 knots when racing was scheduled to start. Race day 2 at the 2017 470 Junior Worlds in Enoshima was forecast to be breezy and Sagima Bay kept to its promise delivering between 15-25 knots of breeze and waves. The Organizing Committee for the 2017 470 Junior World Championships have a range of charter boat offers available for the 2017 Junior Worlds, 2017 All Japan Championship and 2017 Enoshima Olympic Week. The 470 Junior World Championships entered the Finals stage today and the big shifts, especially in the second races later in the day, proved particularly random and problematic. Three races down on day 1 at the 2016 470 Junior Worlds in Kiel, Germany pitches Maria Bozi/Rafailina Klonaridou (GRE) ahead by 3 points in the 470 Women and Keiju Okada/Naoya Kimura (JPN) lead the 470 Men by 1 point. 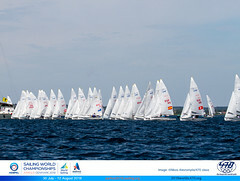 Eighty of the world’s top 470 junior talent faced off on day 1 of the 2016 470 Junior World Championship in Kiel, Germany today, Wednesday 22 June. Both the 470 Men and 470 Women title holders will lead the battle of wills at the 2016 470 Junior World Championship, when racing gets underway on Wednesday 22 June. Join the best 470 talent for teams aged 23 and under at the 2016 470 Junior Worlds in Kiel, Germany. The International 470 Class Association is delighted to announce that Kieler Yacht Club, Germany will host the 2016 470 Junior World Championships as part of the legendary Kiel Week. The age limit for teams competing at the 470 Junior Championship will increase to 23 years with effect from 2015. The Organizing Commitee of the 2015 470 Junior World Championships taking place in Thessaloniki, Greece from 24-31 July 2015 has put together some great rates for hotels. Charter for 470s and ribs is also available. Turkish Airlines has been announced as the Official Airline of the 2015 470 Junior World Championship taking place in Thessaloniki, Greece from 24-31 July 2015. Welcome to the final day of the 2015 Junior World Championships in Thessaloniki Greece. 470 Women Junior World gold medals were in the hands of Italy's Benedetta di Salle/Alessandra Dubbini as their superior form day on day rewarded the partnership with overall victory ahead of the Medal Race. Welcome to day 4 of the 2015 470 Junior World Championships. A late start today for the 204 sailors, gave a chance to visit the stunning city of Thessaloniki and the historic White Tower, whose prominent location dominates the waterfront, the town hall and soak up the general ambience of this buzzing metropolis. Welcome back to Thessaloniki, Greece’s 2nd largest city! A metropolis well known for its hospitality and world famous white tower! Waiting for the wind, second day races were postponed for four hours in Thessaloniki bay, host venue to the World’s best junior 470 sailors. All teams competing at the 2015 470 Junior World Championships in Thessaloniki, Greece from 24-31 July, must have entered and paid the entry fee by 23 June 2015 to benefit from the earlybird entry fee of EUR280. In a partnership with the well-known “Speed & Smarts”, teams at the 2015 470 Junior World Championships will have the chance to test their racing knowledge. Hot, humid and no wind was the order of play on race day 3 of the 470 Junior Worlds. The Masters’ Cup and Open Classic fleets enjoyed a day off, but the junior fleets waited for a breeze that never materialized. Race day 5 at the 50th Anniversary Celebration in La Rochelle, France awarded titles to the four divisions in the 470 Masters’ Cup fleet. More than 20 teams from Australia, Belgium, Germany, Greece, Hungary, Italy, Ireland, Japan and Malaysia are attending the International 470 Class Clinic, which is taking place immediately before the 470 Junior World Championships in Medemblik, The Netherlands and run by world class coach Andreas Kosmatopoulos (GRE). British teams are at the top of the Men’s and Women’s divisions after a wet and windy first day’s racing in Holland at the Delta Lloyd Junior 470 World Championships. Racing at the 470 Junior World Championships kicks off on Friday 22 July, with 94 teams from 26 nations ready to contest the regatta in Medemblik, The Netherlands. Winds gusting up to 28 knots tested the 92 teams to the limit in Medemblik on day two of the Delta Lloyd Junior 470 World Championships. It was a tense morning waiting to see if there would be any racing for day three of the Delta Lloyd Junior 470 World Championships in Medemblik, Holland. Much lighter winds brought a change of pace and a reshuffle of the pack in the women’s division at the Delta Lloyd Junior 470 World Championships in Medemblik, Holland. A frustrating day of light winds and rain yielded just one race but plenty of leaderboard changes on day five of the Delta Lloyd Junior 470 World Championships in Holland. Italian teams won both the Men’s and Women’s heats today. Day six of the Delta Lloyd Junior 470 World Championships in Holland and for the first time in a while the sunshine smiled on the 92 teams from around the world. Day 4 of racing at the 2010 470 Junior World Championships in Doha, Qatar delivered the best weather conditions of the Championship so far, which for many teams have translated to best performances. The men/mixed fleet were up early this morning, ready for a scheduled race start of 0900 hours. Japan's Saki Goto and Hiromi Nishiyama had a day that you could only dream about as they notched up three race wins out of four races - hat trick and some. Ku Anas Ku Zamil of Malaysia declared yesterday that he was aiming for a podium finish with crew Mohamad Hafizzudin Mazelan at the 2010 470 Junior Worlds in Qatar. Racing has started here in Doha. See the Twitter feeds and live tracking for latest updates. Races 1 and 2 for Men/Mixed and Race 1 for the Women now online via the Results page. 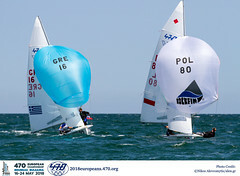 Immediately before the 2010 470 Junior World Championships, the 470 Class will be running a Training Clinic, led by world-class coach and Olympian Andreas Kosmatopoulos (GRE).